St. Martin's Griffin, 9780312675110, 304pp. Finding Abu Musab al Zarqawi, the leader of Al Qaeda in Iraq, had long been the U.S. military's top priority—trumping even the search for Osama bin Laden. No brutality was spared in trying to squeeze intelligence from Zarqawi's suspected associates. But these "force on force" techniques yielded exactly nothing, and, in the wake of the Abu Ghraib scandal, the military rushed a new breed of interrogator to Iraq. Matthew Alexander, a former criminal investigator and head of a handpicked interrogation team, gives us the first inside look at the U.S. military's attempt at more civilized interrogation techniques—and their astounding success. Matthew and his team decided to get to know their opponents. Who were these monsters? Who were they working for? Every day the "‘gators" matched wits with a rogues' gallery of suspects brought in by Special Forces: egomaniacs, bloodthirsty adolescents, opportunistic stereo repairmen, Sunni clerics horrified by the sectarian bloodbath, al Qaeda fanatics, and good people in the wrong place at the wrong time. This account is an unputdownable thriller—more of a psychological suspense story than a war memoir—and a reminder that we don't have to become our enemy to defeat him. MATTHEW ALEXANDER is an eighteen-year veteran of the Air Force and Air Force Reserves. A four-time combat veteran of Bosnia, Kosovo, and Iraq, he was awarded the Bronze Star Medal for his achievements in Iraq. 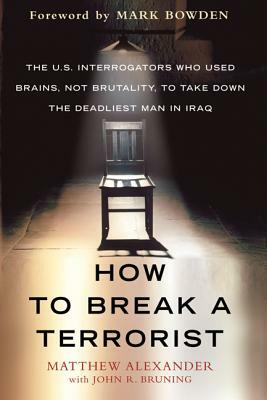 He is the author of How to Break a Terrorist. John R. Bruning is the author or co-author of eight books, including House to House by David Bellavia.